There’s no doubt we're incredibly blessed to call this beautiful country home. With its lush native forests, lakes and rivers to its spectacular mountains and valleys, there's so much to explore. Good thing we've got the tramping tracks to showcase some of the best scenery in Aotearoa. Maintained by the Department of Conservation, these New Zealand great walks range from 32-82 kilometres long and take between three and six days to complete. Naturally, you’ll want to follow the rules and take care of our stunning environment. Discover the gorgeous ‘sea of rippling waters’ that is Waikaremoana on this 46-kilometre tramp around the shoreline. Over four days and three nights of tramping, you'll experience the incredible views from Panekiri Bluff and the breath-taking Korokoro Falls in the middle of the rainforest. There are secluded beaches and huge native trees, as well as the opportunity to experience the rich spiritual history of Te Urewera. There are five huts and campsites dotted along the track—it's up to you if you want to pitch a tent or take the more sheltered option. Explore your way through Tongariro National Park on this 41-kilometre great New Zealand walk, which winds its way around the active volcanoes, Mount Tongariro and Mount Ngauruhoe. Showcasing incredible landscapes, glacial valleys, alpine meadows, active volcanic craters and emerald coloured lakes, it’s a must do. This is the perfect walk to immerse yourself in the native plant and bird life—the track is home to a diverse range of birds including bellbird/korimako, tui, robin/toutouwai, tomtit/miromiro and fantail/piwakawaka. Paddle up the Whanganui River in a canoe and experience the valleys of Manawatu. Take a break from travelling by water for a short walk to the Bridge of Nowhere, set amidst the beautiful, dense forest. The 145-kilometre journey along the river can be accomplished in five days by canoe, or there's the option for a shorter three-day journey. Don’t forget to look out above for bats flying over at dusk. Walk this stunning 60-kilometre track over three to five days and surround yourself with not only gorgeous golden beaches, but beautiful coastal bush as well. During your trip you'll discover Cleopatra’s Pool, a tranquil rock pool with a natural waterslide, buried in the native forest. You also have the chance to see the stunning inlet to Falls River while crossing a suspension bridge. Make sure to keep your eyes open for fur seals on the rocks below. If you love walking and tramping, but also have a thing for mountain biking, this is the one for you! 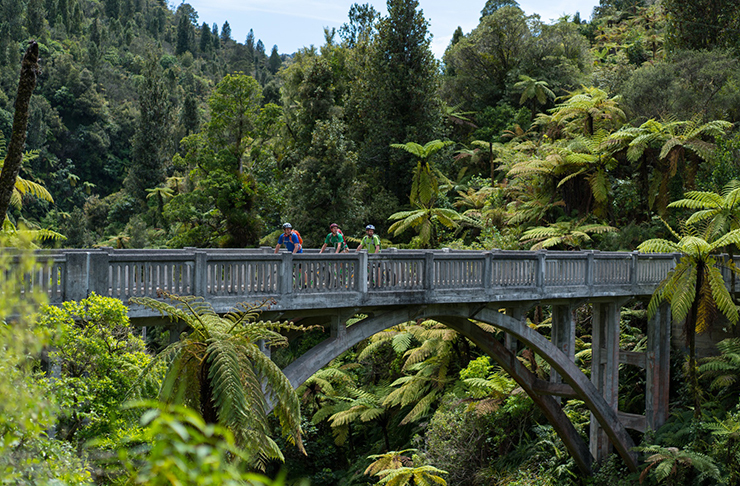 This 74-kilometre track will take you around the West Coast over four to six days, giving you the opportunity to spot rare wildlife like the great spotted kiwi and nocturnal carnivorous snail. You’ll wind your way through beautiful forests covered by red and silver beech, past glistening pink granite bedrock, studded with large crystals of mica and quartz, and through a forest of ‘Podocarp’ trees. You may even see the native kea and kaka if you are lucky! Said to be ‘the ultimate alpine adventure’, this great New Zealand walk is an absolute must for explorers and nature-lovers alike. It's 2-4 days long, and just 32 kilometres all up, but it's packed with spectacular scenery every step of the way. Winding your way through the Routeburn gorge, you'll have views of the crystal clear Route Burn River and will pass two stunning cascading falls—the Routeburn and the Earland. When you aren’t hiking around the river, you'll be climbing your way up steeper trails, making for incredible scenic views. Explore the Fiordland wilderness on this 60-kilometre loop track, which takes you through stunning alpine views and valley beech forest. Take your time exploring the depths of the Luxmore Caves before heading to the Iris Burn Falls. You'll also have the chance to take in the gorgeous views of the alpine grasslands and the tranquillity of Lake Te Anau. Find yourself retracing the steps of early explorers on this track that's said to be the ‘finest walk in the world’. Journey through glacier-carved valleys and rainforests and allow your breath to be taken away with the spectacular panoramic views from Mackinnon Pass. Be sure to make a detour to the Sutherland Falls, which drop for 580 metres. This is a once-in-a lifetime adventure that you'll never forget. The last New Zealand great walk is the Rakiura Track. This 32-kilometre coastal track is a total island escape, surrounded by beautiful beach and bush galore. 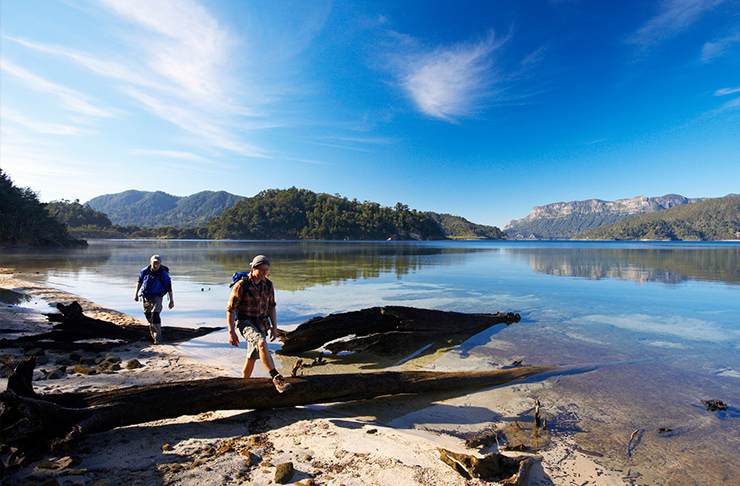 The track lets you immerse yourself in history and explore early Maori settlement sites found on Stewart Island, before strolling along the shores of Paterson Inlet. Make sure to listen out for the native kiwi calling, or look for its footprints.